Delegate Mary Beth Carozza, a Republican who was elected to represent District 38C four years ago, announced Sunday she will challenge incumbent Sen. Jim Mathias, a Democrat, in the 2018 election. "I believe it is my calling," Carozza told a large group that gathered Sunday at Ocean City Elementary School. Carozza, 56, grew up in Ocean City, where her family operated a drive-through restaurant called Beefy’s. She graduated from Stephen Decatur High School in Berlin and the Catholic University of America in Washington, where she earned joint BA and MA degrees. At Sunday's campaign event, she credited her parents, Tony and Mary Pat Carozza, with instilling in her a good work ethic and an understanding of the challenges that small business owners face. "My roots have shaped my public service," she said. Carozza has spent most of her adult life in public service, including stints at the Department of Defense during the Bush administration and as former Gov. Robert Ehrlich's deputy chief of staff. Gov. 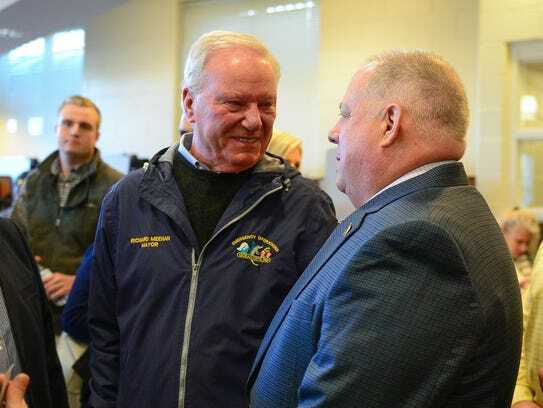 Larry Hogan, who was on hand Sunday as Carozza made her announcement, called on Lower Shore residents to support her election bid. Hogan, who called himself "not a partisan guy," said he respects Mathias and tries to work across the aisle with Democrats. But he said Mathias often supports the liberal Democrats from the metropolitan areas in the General Assembly. "Your current senator votes with the bad guys," he said. Carozza said she hopes to lend more support to Hogan if she is elected. "Gov. Hogan needs to be re-elected and he needs more team players in the Senate," she said. Mathias said before Sunday's announcement that he wasn’t surprised to hear Carozza plans to run against him. “It’s been talked about since she was elected delegate,” he said. Mathias said he plans to run for re-election, but is focused at the moment on the upcoming session of the General Assembly, which starts in January. 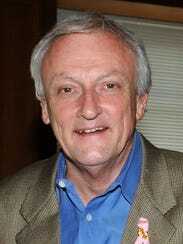 Another candidate who is running for the seat is Ed Tinus of Whaleyville, a Republican. He will face Carozza in the Primary Election. Carozza took home 11,019 total votes, compared to Davis' 3,884, according to Election Day data from the Maryland State Board of Elections. Carozza campaigned on a platform of having a career in senior leadership for several elected officials. She spent four years as a deputy chief of staff for former Maryland Gov. Robert Ehrlich, and had also worked behind the scenes for several members of Congress. “By going to school in Washington, D.C., that's really where I was informed with my commitment and love for public service,” she said in a 2014 interview. So far, no one has filed to run for the District 38C seat in the House of Delegates. The seat was a new one in the last election after district lines were redrawn. It mostly covers the areas of northern Worcester County, including Ocean City, West Ocean City and Ocean Pines. It's also the district for the Worcester County communities of Germantown, Libertytown, Newark, Showell and Bishopville. In addition to also including some parts of Berlin and Snow Hill in Worcester, the district also extends into eastern Wicomico County, including Pittsville, Willards, Powellville, Parsonsburg and small areas of Salisbury and Delmar.